Ian Lowry from Padgetts Racing riding the Honda CBR1000R who was in second place during qualifying gave a shock to Tommy Hill from Swan Yamaha the defending champion during race at Thruxton by coming on top in the race 1.The difference between Ian Lowry and Tommy Hill was 2.749 seconds. In third place was Josh Brookes from Tyco Suzuki riding on Suzuki GSX-R1000 who started in 7 th position and had a time difference of 13.136 seconds. In fourth and fifth place were team mates Shane Byrne and Stuart Easton respectively from Rapid Solicitors Kawasaki riding the Ninja ZX-10R bike.The time difference was 13.566 seconds and 14.435 seconds respectively. Jon Kirkham from Samsung Honda who won at Brands Hatch Indy had settled for seventh place with a time difference of 18.473 seconds. Michael Rutter who qualified in thrid position was not classified in the race. Scott Smart from Moto Rapido racing riding the Ducati 1199 Panigale RS finished in 18 th position. Alex Polita from Jentin Doodson Motorsport who was also riding the 1199 Panigale RS finished in 19 th position. Here at British Super Bikes the 1199 Panigale RS used by privateer teams did not proved successful in this season. The Ducati 1199 panigale RS is a race ready super bike to be used by two British Super Bike teams in 2012, Moto rapido racing and Jentin Doodson Motorsport.The bike is expected to be rpiced around € 80,000. 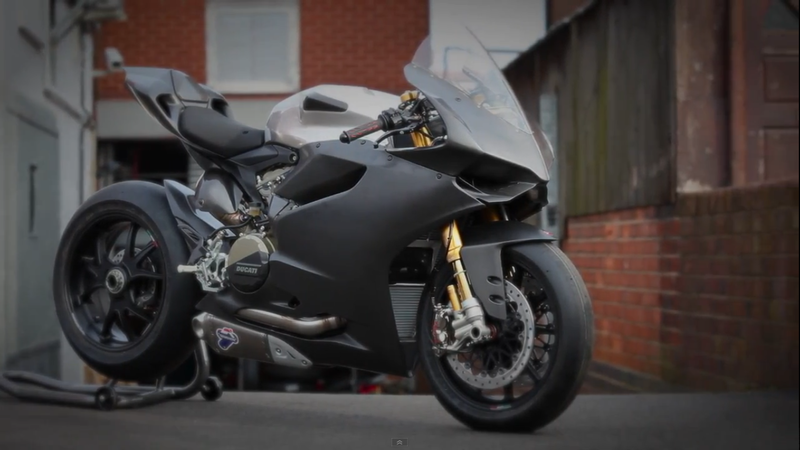 The bike has a complete Termogini exhaust system which is 2 kg less in weight than the standard 1199 panigale and an approximate 5% increase in power.The bike has a two tone grey and silver color and the silver color tan is derived from the racing division of Ducati the Ducati corse. The suspension is gas charged Ohlins FGR 900 derived from Moto GP.The alloy wheels of the bike are identical to the ones used on 1199 panigale S model.The Brembo disc brakes used on theis bike are different from the production version of the 1199 panigale.The bike uses carbon fibre to reduce weight.The carbon cover for suspension and the carbon rear mud guard and also the carbon clutch casing are available as accessories for the standard 1199 panigale and S models. This bike is not yet released for the public.But going by Ducati tradition of Limited edition super bikes this bike may be released as a limited edition in 2013.